Oldwick soup flavors change each week and come in a variety of flavors. Weekends at the Stockton Farmers Market you can warm yourself with a cup or bowl of soup with exotic names including Thai Curried Coconut Carrot, Wild Chipotle-Marsala Mushroom, Not Your Grandma’s Chicken Barley, Hot Honey Pesto Tomato Bisque, Guinness Irish Cheese and Winter Sage Split Pea Soup with Chorizo. 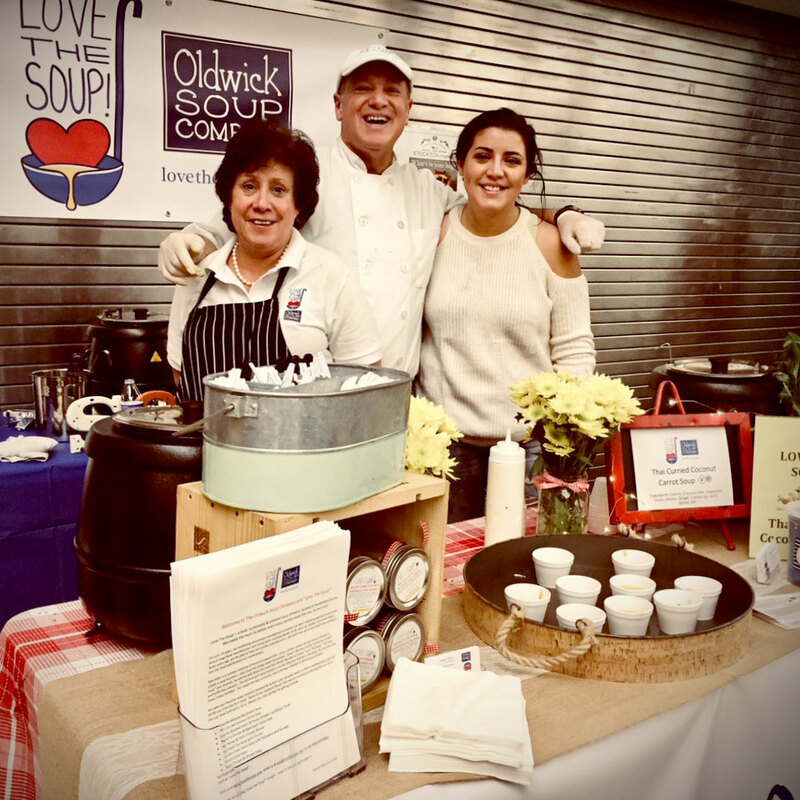 Those are just a few of the many creations of Bob Hiller, a former marketing specialist-turned-chef who created the Oldwick Soup Company because he has always loved making soup. “I always wanted to do a soup-of-the-month club,” said Hiller, starting from the days when he created his first original soup after attending the Culinary Institute of America. That soup combined curried carrot and ginger and was the precursor to his Thai Curried Coconut Carrot Soup, which is the top seller at the market. Several years ago Hiller decided to quit the marketing business and make soup full time. Working with him is his family, including daughter Fallon, who works at the soup station Friday nights and all day Saturday and Sunday. The pair also make the soups and sells them online and they are shipped frozen. When Hiller is developing a new soup he starts with fresh ingredients – as many purchased locally as he can find – and thinks about flavor combinations he enjoys. Then he starts to add more elements. “There are many different layers of flavor in each soup,” he said, using his Hot Honey Pesto Tomato Bisque as an example. He started with tomatoes, adding pepper for heat and honey for sweetness. But he thought it needed something more, so he whipped up some pesto from scratch, and added that to give the soup more depth. “I work to make each soup a little bolder,” he said. Each weekend at the market brings a different lineup of soups based on availability of ingredients and what Hiller feels like making that week. He makes them in 20- and 40-quart batches, freezing some for shipping customers, putting some in quart jars for sale at the market, and keeping some ready to heat up and serve hot. Friday is a big night for food sales at the market; many customers stop in for dinner from the various restaurants that have stands. Saturday is another big day for dishing out cups and bowls of soup, and by Sunday more customers are buying jars to take home and eat during the work week. Sales of cups, bowls and jars have been good, he said. “Our customers really appreciate what we do here,” he said. 19 Bridge St., Stockton, N.J.
4-8 p.m. Fris., 9 a.m.-4 p.m. Sat., 10 a.m.-4 p.m. Sun. 8-ounce cup $5, 12-ounce bowl $8, 32-ounce jar $16. Thai Curried Coconut Carrot Soup, Wild Chipotle-Marsala Mushroom Soup.